Standing on a small ledge above a rather alarmingly large sea we scoped out the route ahead of us, BOOM, a big wave hit the wall to our right and the spray went high above us, mercifully not over us but all over the bottom of the route we were about to climb. I had already committed to leading the first pitch so off I went, I just did not fancy my chances of staying dry on that belay ledge. Stepping up and out right into an off balance spot under a bulge I stuck in a large nut and pulled on rather smaller than anticipated holds over it and onto the ramp above. BOOM another wave hit the wall beneath me and to my amusement went over the top of both Choire and Henry who were watching my progress from the belay ledge. With their squeals echoing in my ears I hid my smirk by pointing my face upwards and got on with the task of climbing the rest of the pitch in dry clothes enjoying the warmth of the unseasonal Halloween sunshine. The two pitch route was a delight, some steep rock with great exposure and good gear, the warming sun drying out the rock from the previous nights downpour. This however was just too tame for Henry ( I spell my name DANGER ) Castle. Now lets be clear here Henry is one of the best MIA’s I know, he runs the cliff rescue courses for the BMC and has a highly successful business ( Climb Pembroke ) catering for the needs of all climbers. 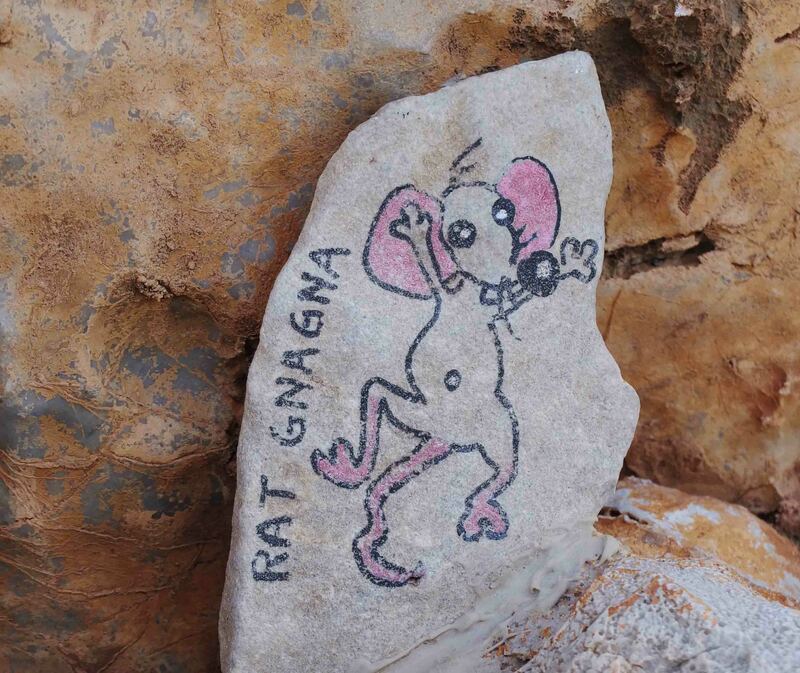 But when he is out with other similarly minded climbers he tends to go for the esoteric, something I would have done well to remember before agreeing to move to another crag. I saw a picture of the crag in the guide book which was taken from the sea looking onto the crag a number of E’s were in evidence, lulled into a false sense of security by the slightly overhanging and steep number we had just dispatched my heart sank when I dropped over the lip of the crag on the abb rope into complete space, by the time I was on the bottom my feet were a good eight metres from the cliff. I looked up at 50m of seriously overhanging dark and dank rock, BOOM, a big wave hit the rocks behind me and I felt the spray wash over me, it was low tide and it was only going to get higher. WHACK a big drop of water from the lip of the roof above hit me square in my upturned eye, by the time I could see again Henry was roped up and geared up and on his way. 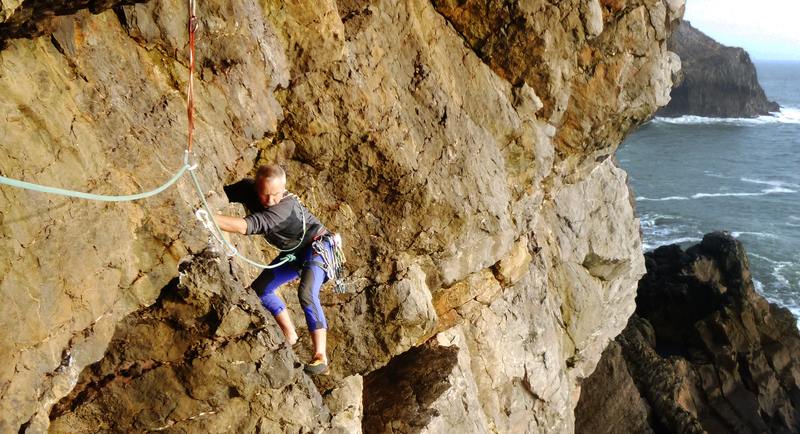 I watched with increasing concern as he made his way up the crag, overhanging thrutches, slippery slabs with big steps over bulges on crimps, more overhangs then a 6m traverse to a dark and dripping niche below a massive roof. I looked around for an easy escape route, crap, I was committed. 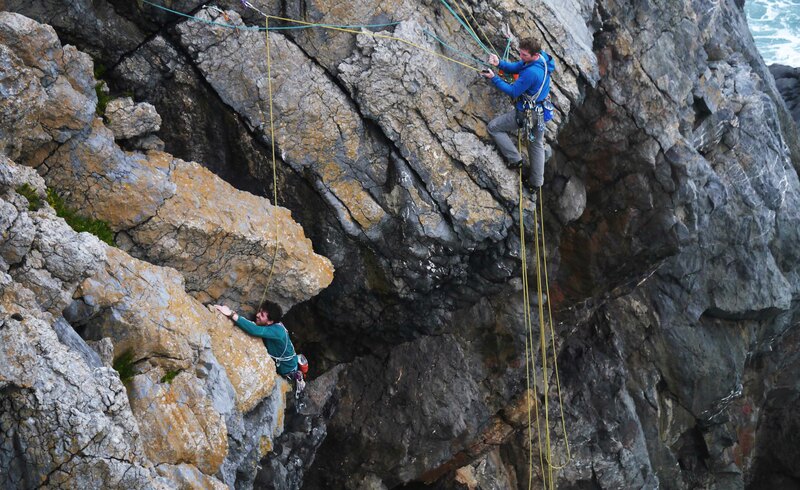 Watching Choire’s ascent did not make me feel any better so on the basis that it was either get up it or get very very wet swimming in a large sea I proceeded to dispatch the initial overhangs and slippery slabs with only a slight pull on one bit of gear. I got to the traverse below the niche and realised that once I took out the gear I would have an unprotected 3m traverse above a big roof with a sharp edge on it. 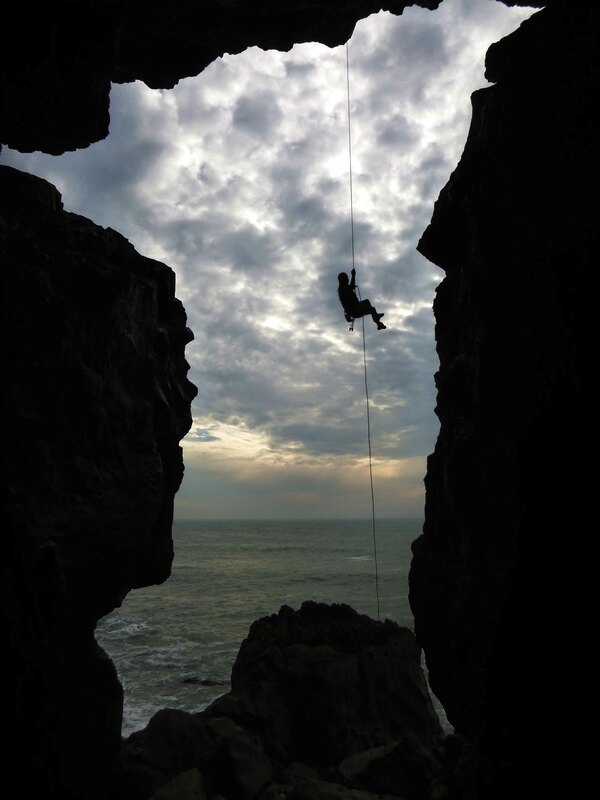 I hate traverses, I hate traverses which involve stepping down onto sloping ledges with a massive swing waiting beneath me, the glistening knife edge lip of the ramp I was standing on just waiting to sever the single rope tied to my harness as it slides along the razor sharp edge. The crashing sea below waiting to swallow my plummeting body and then dashing any hope of survival as it grinds me against the needle sharp rocks. Well I made it but ensconced in the niche from hell it was clear that I was going to like the next pitch even less. Henry and Choire on the final heave over. Henry was in his element, he described the next pitch as a bit of a “scuttle” which to me conjures up a vision of being down on your haunches, kind of crabbing along, what was actually involved was a pull up over another bit of overhanging rock onto a ledge which had about two feet of headroom, this was not a scuttle, this was unquestionably a slither or a squirm. The rock above the squirm projected about another two feet further than the squirm ledge until you had made your way along it ( about 3m ) where there was a break in the rock above which meant that it was only about two feet overhanging. The distance between the squirm ledge and the break above was about 30 inches. I must start yoga, going from a belly down squirm position to an overhanging heave position in 30 inches put all kinds of pressures onto various parts of my anatomy best left unchallenged. I made it of course but am still suffering the consequences. 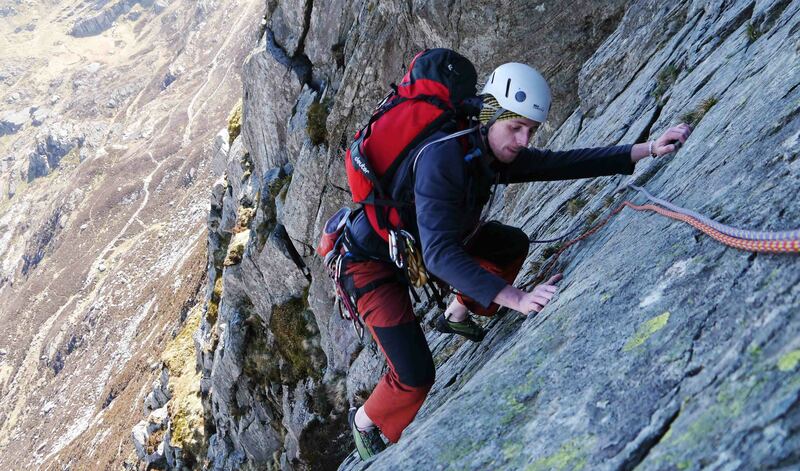 The next day we went down to the newly developed Disco Buttress, buts thats another, more enjoyable story all together. Choire on Disco Leg, before Disco Leg propelled him into deep space. 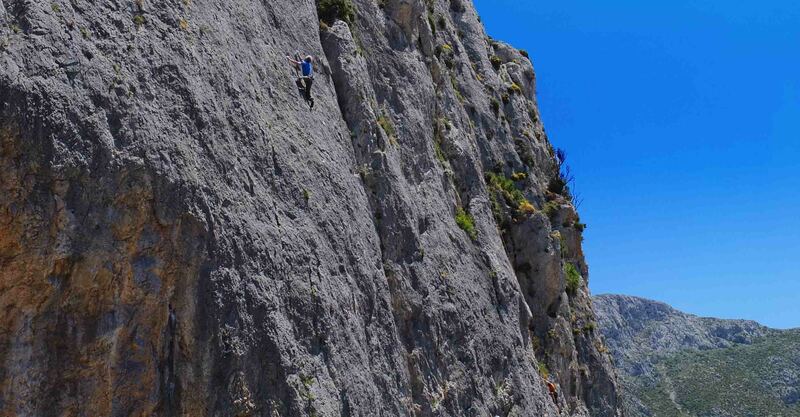 I have a deep love and almost hate relationship with Kalymnos, which for those of you unfamiliar with the Greek island is probably the most popular destination in the world now for sport climbing holidays. 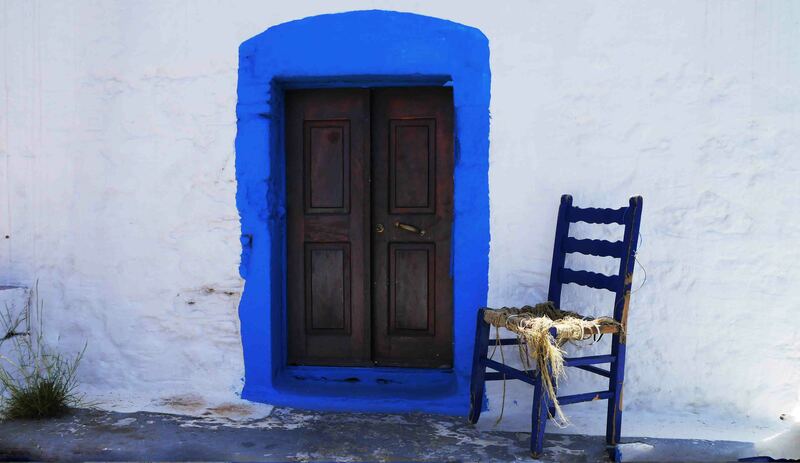 There is no blue like the Greek blue. 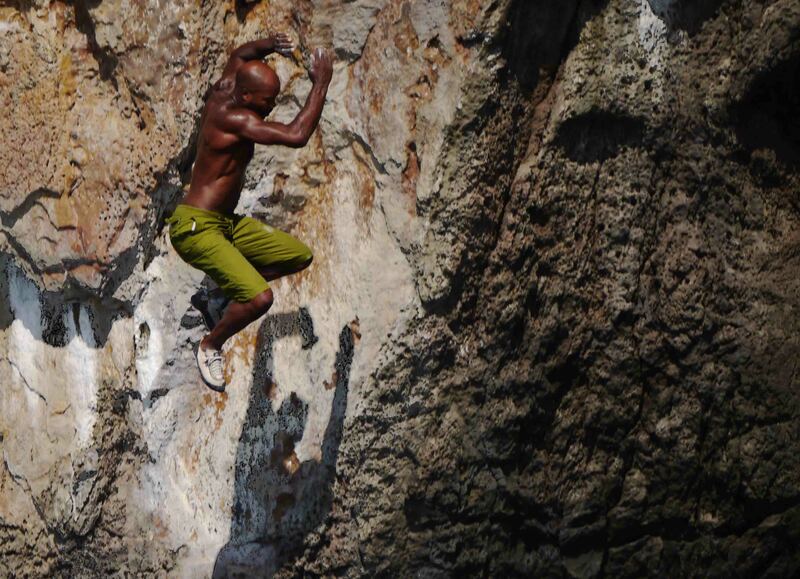 Kalymnos is set up for and populated by climbers almost exclusively during the months of March – May and Sept – Nov. 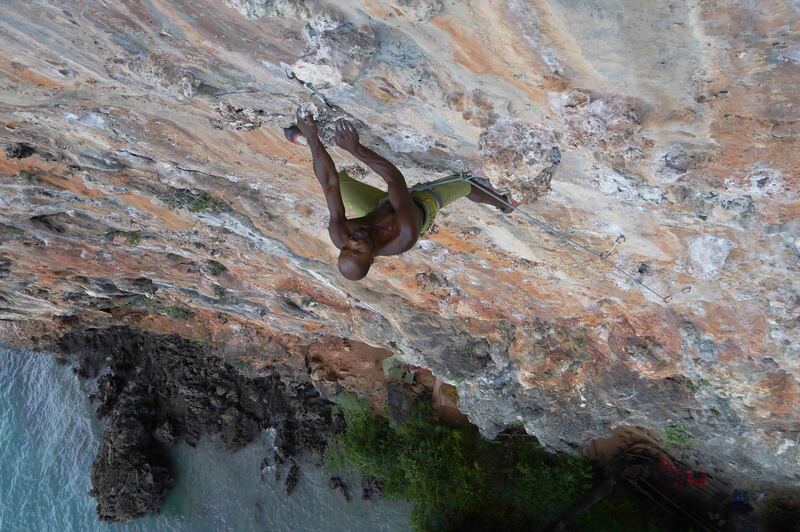 The island has not been slow in tapping into this revenue stream and business dedicated to climbing have proliferated. Scooter hire, studio apartments for rent, funky climbing clothes shops, climbers coffee bars blah, blah, blah. Some of these are essential, some are luxury pandering to the increasing affluence of the climbing community. As the island has become the must go to venue for the holidaying climber so the prices have increased, accommodation has almost doubled in four years, some restaurants have become just a tad more expensive and plush and the all so essential scooter hire business ( you must have one even if the crag you are going to is a 20min walk from your accommodation ) have doubled if not trebled. When Choire and I went last Oct we vowed not to go back again at that time of the year as the island was heaving due to it being optimum time of the year ( temp wise ), coupled with the North Face climbing festival. I do not like climbing in crowds. May, Jane and I went out for three weeks and met a few friends from Scotland who had also decided to spend some time there. It was much more enjoyable this time around, there were fewer people and the weather, although getting hotter, was just a bit cooler. We had a good trip, visited some of the old favourites ( crags ) and went to a few new ones brought to our attention in the newly updated downloadable topo. Pallionasos give two or three days excellent grade 6 and low 7 climbing, Prophet Andreas is more than well worth a visit, if you are a super star wanting to power shout and scream your way up something really hard then Secret Garden is the place for you and if you are looking for something just a bit different from the usual Grey slabs or orange tufa draped walls then Kastri might excite you. However what entertained me almost just as much was watching the other climbers behaviour around about me. Now I am not setting myself up here as a paragon of virtue and suggesting that by characterising some behavioural traits about this I am better, I just think it is worth a bit of a laugh. When you have risen early and are first on the crag the others that start to arrive will look to see what you are climbing and then in an unreasonably louder than necessary voice say to their mate ” wheres that three star 6c we want to warm up on” said for your benefit especially as you are on a 6a+ or similar. Can also be found in steadily increasing numbers in the pub at night as the amount of alcohol consumed increases, routes are never referred to by name only by grade. You are enjoying a bit of peace and early morning calm when suddenly a group of 12 – 15 climbers appear over the hill descending on your chosen venue for the day like a cloud of locusts on a corn field. They then set up ropes on all the best routes and when you ask if they are finished ( rope and draws left up ) say “ach, no there are still another six of the group going to climb this”. God I wish I was getting the royalties from the sale of E9 clothing, especially the lime green trousers ( its the colour of 2015 ). I hate uniforms, I was kicked out of the Boys Brigade for refusing to wear the hat, and jkt, and trousers come to think of it. Generally younger, stripped to the waist, climbing harder routes, never have a camera with them as it is just too uncool to take photographs of your mates whilst they are climbing let alone post them on facebook ( heaven forbid ). Anyway, enough already. It was a great trip with great company some old and some newly met along the way. I will go back, there is still lots to climb there. A pied wagtail stuttered around like a crazy clockwork toy on the grass outside the Climbers Club hut in Llanberis. A soft breeze blew and an early morning sun lit the bulk of the Gyrn Las crag in the cwm some 300m above me. Breakfasted and packed Choire and I sweated our way up the side of the Cwm Glas Mawr as it hurled itself in a suicidal rush down the rocks on our left hand side. Its exhilarated babbling seemed to be an exclamation of delight at being released from its snow bound state in the higher Cwm by the warm spring sun. 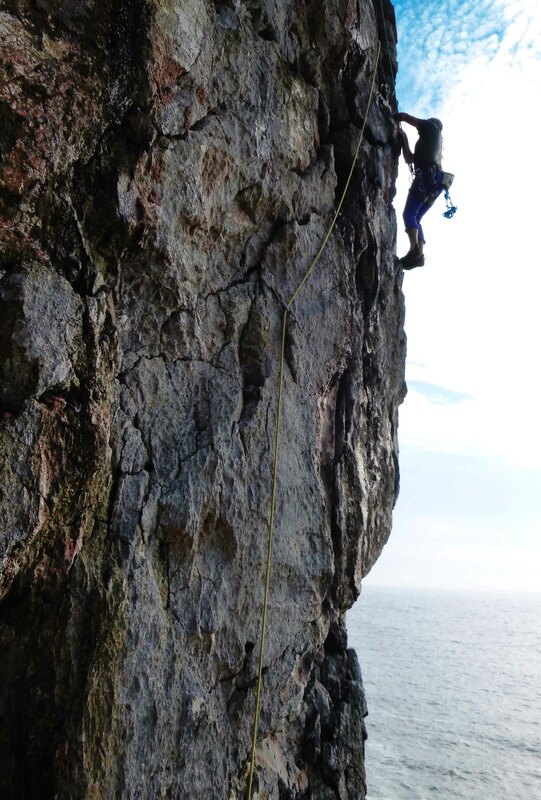 I knew how it felt, I had harboured ambitions to climb main wall on the crag for some years, thwarted by bad weather, lack of a suitable partner or just other things to do. Described as never desperate but requiring a confident approach and a serious undertaking in the guide book, the grade of HS ( especially in Wales ) was not to be taken at face value, I was feeling confident, just like the river was in reaching the sea, I knew it was on. We scrambled up the rocks and scree to the bottom of the first pitch, geared up and I led off up a slabby undertaking, a bit sparse in the way of gear and wet in places to a nice big grassy ledge. It was not enough for me so I started up the second pitch but was stopped by a rightwards leading ramp which would have given me horrible rope drag. Choire joined me, we swapped gear and he headed off along the ramp towards a chimney described in the guide as “often being wet”. I knew he was going to be out of sight so we decided that if the chimney was wet it might be better if he belayed at the bottom of it and we treated it as a separate pitch. The rope kept going and when he eventually called safe I knew he had passed it. I followed on, rounded the corner and shouted up to Choire, “Wasn’t wet then” the grunt from above reached my ears at the same time as the water running off the sling placed at the bottom of the chimney reached my eyes. I precariously balanced my way along the ramp to find a black chimney running with water. By the time I had slipped, splashed and generally cursed my way up it my nerves were in tatters. I joined Choire on a nice wide ledge wet and cold ( the sun had now disappeared over the top of the north east facing crag ) and generously offered him the next pitch as well. To my amazement he seemed delighted and off he went. In hindsight this was a big mistake, I sat down on the ledge with the ropes in my hands and started to shiver, the cold from the rocks soaked through my wet trousers and I started to get unreasonably worried. By the time he called me on I was so stiff I could hardly move. Creaking my way upwards using hands and fingers through which I could barely feel the rock I joined him on a lovely big stance on which I could jump about a bit to get the circulation going. Seeing my distress he offered to take the next pitch as well, what can I say, a boy that looks after his old dad. I promised him I would lead the last two pitches and he looked genuinely dissapointed. Off he went, I started after him some 30 mins later feeling warmed by my aerobic exercises on the ledge whilst belaying. Described in the guide as “the big pitch with some loose rock” I pulled up on a block which was only there by the grace of god, certainly not gravity and clambered up onto a pinnacle which pointed its sharp top toward heaven. I felt it wobble so hastily made a series of rather desperate moves up and around a corner pulling on pinches and edging my feet along a ledge that sloped just the wrong way. A fall from here would not have been fatal but it would have been a wee bitty scary, there was not a great deal of bomber gear between myself and Choire some eight or nine metres away to the left. “On you go then” he said when I reached him proffering me a handful of draws and nuts, seemed he was taking me at face value then, I had no option, you have to pull your weight after all. A lonely raven cronked, a peregrine sailed effortlessly along the line of the crag far below, my head felt good as I set off. its the thought rather than the actuality that frightens. The penultimate slab pitch was a delight, ( especially as I was now back in the sun) so much so I ran the last pitch out as well. The rat had been fed and we felt good. A tale of two islands. Eeeeeeeeeeeeeeeeeeeeeeee went the little 125cc bike engine as we made our way North out of Ao Nang towards the pier at Tha Lane. The early morning sun lit the surreal landscape of jungle covered karsts rising sheer from the ground with an ethereal orange light, the road twisted and turned its way through these monoliths. It was chilly enough to warrant a lightweight fleece for the 40 min journey. 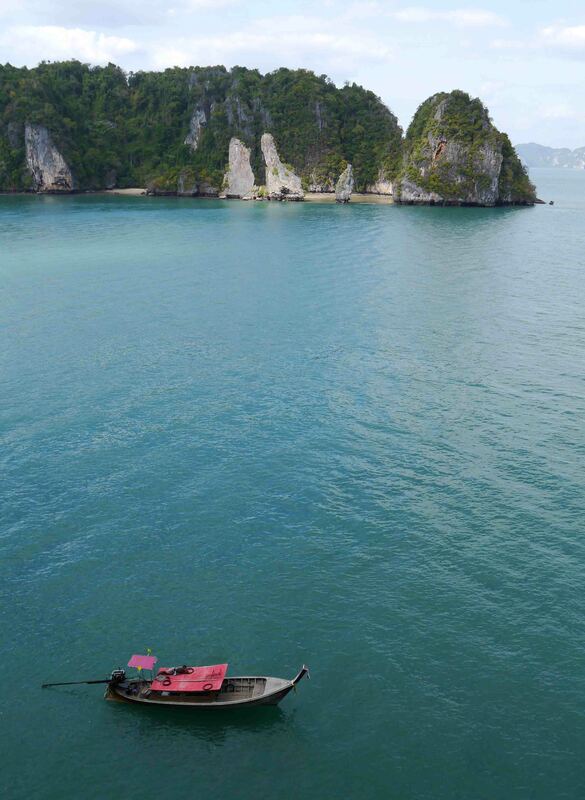 We arrived at the pier and swapped our two wheels for a long tail boat which continued the journey between jungle covered karsts, this time rising sheer out of the Andaman sea. Jane and I were heading for Koi Yah Noi, an island some 40mins from the mainland, we had been there last year but this time we were taking a day trip out to a climbing sector only accessible by hiring a boat for the day. We had teamed up with Trev and Desiree from Rock and Sun who were running a coaching session there for their clients as this made the cost more attractive for everyone concerned. Trev on “The Monkey and the Engineer”. We arrived under a towering wall of vertical ( at its least steep bit ) limestone only accessible by a hanging ladder to a purpose built bamboo hanging mezzanine platform, we shuttled climbing gear, food, water and people and the boat departed a safe distance to avoid being bashed against the vicious limestone rocks by the light swell of the ocean. We sorted gear and started climbing. Grateful wall, as it is called, is an awesome venue for the grade six climber, some dozen or so 25 – 35m routes generally between 6B and 6C+ with a couple of easier 6A ( and one 5 ) warm ups. 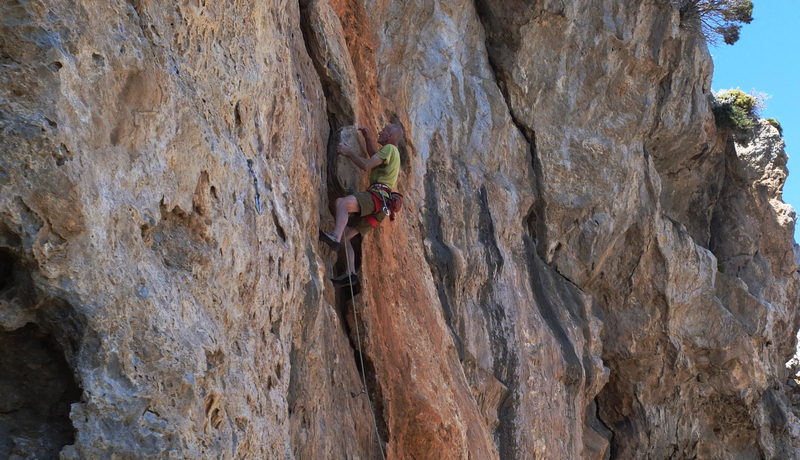 The routes are steep and the wall has a mix of traditional limestone tuffa type climbing and a wall of amazing cauliflower like protrusions that make for some big moves between great holds and occasional dubious shallow pockets. We climbed for some six hours, which is a long time in Thailand, and ticked most of the routes on the crag. Being next to the ocean we had less humidity and a nice breeze to keep the temperature down but my arms still felt like I had done battle with a land rover in a tug of war. The setting sun chased us back up the winding road through the Roger Dean landscape, our inner beings at peace with the world that only a day of adversity on the rock with great company can bring about. A couple of days later we bumped into the Rock and Sun guys again and they suggested we share transport down to Lao Liang, an island some 40K off the south west of Thailand. I had long aspired to visit this place but for many different reasons had just never managed to fit it into our trips to Thailand. So, three days later we found ourselves on a boat heading out of a small harbour near Trang bound for a rock in the middle of the sea. The island appears in the distance. As we sailed over a millpond sea I realised just how accurate this description is as the rock of Lao Liang came into view. As we got closer a small beach, perhaps 300m long came into view, dwarfed by the sheer jungle covered cliffs that rose above it and dropped vertically into the sea on either side where the beach ended. The boat slid in over a “house” reef covered by crystal clear water and put us and our luggage out on a shining white coral sand beach. A small swathe of ground behind the beach held a few ( luxuryish) tents, a building which served as a kitchen and an open seating area. This was it for the next three days and what a three days they turned out to be. The climbing there is simply awesome with 70 plus pitches from 5 to 7c, generally single/two pitch (extension) routes but a few three/four multi pitch routes, some of the routes there are simply the best climbing I have done in Thailand. The “vibe” ( a term that does not really sit comfortably with me ) is really nice, most folk are climbers, rising leisurely, climbing when the crags come into shade and then chilling out in the evening with a couple of beers on the beach. The food is good ( all supplied in the price ) and the accommodation is perfect. I cannot speak highly enough of this place, it is a true paradise, a place that I thought only existed in the mind or an Alex Garland book. Is he on, or is he off ? We climbed every day, we took a boat out and did a circuit of the island, did some Deep Water Soloing, ( well the others did ) and snorkelled and enjoyed a peace and tranquility that only an island existence can really bring. Nathan goes for the big bridge on “Blood Meridian” great route, great name. I doubt this would be everyones cup of tea but for me I have discovered something that is simply beyond superlatives. I will go back, as soon as I can. It was with a real sense of regret that we packed our bags and headed back to Ao Nang, but hey its not all bad, we still have four weeks more here. The king is dead, long live the king, El Chorro 12th Jan 2015. What the local people think of the development. 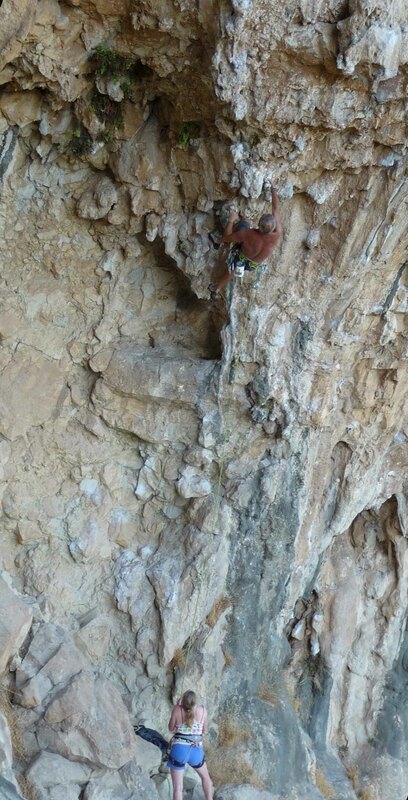 Last time I went to El Chorro I decided that I was not going back again for the foreseable future, I had climbed most of the stuff within my grade range and every time I went back I ended up at the same old crags doing the same old stuff. Nothing new, no challenges, nothing to excite me. It came as a wee bit of a surprise therefore when I came back from Jordan to find out that Jane had booked us flights to Malaga for the 1st of Jan for an anniversary present. Now you just can’t complain when your nearest and dearest books flights for a two week climbing trip for a wedding anniversary. Problem was that when she had tried to get us accommodation at the Almona Chica http://www.iha.com/Gite-self-catering-El-chorro-La-Almona-Chica_53097 we found that they were fully booked so we defaulted to booking camping accommodation at the Olive Branch. We arrived tired from an 0300 start to find no one expecting us and a scene that resembled more of a refugee camp than holiday accommodation. We quickly decided it was not for us and went looking for an alternative place in which to lay our heads. Now before anyone gives me abuse about the Olive Branch being their favourite place I can only say that after spending most of 2014 in a tent I was not really looking forward to another two weeks of the same. That coupled with, in my opinion, inadequate facilities ( showers and toilets ) and unhygienic cooking facilities we decided to run away somewhere else. I am advised that if you have a room in the house it is a great place to stay, cannot comment on that but someone who was camping told me they managed to get one warm shower in just over a week. I think we made the right decision for us. We ended up staying in the Garganta hotel for two nights ( nice but ridiculously overpriced ) and then back at our favourite place, the Almona Chica which has been improved and is great value for money. 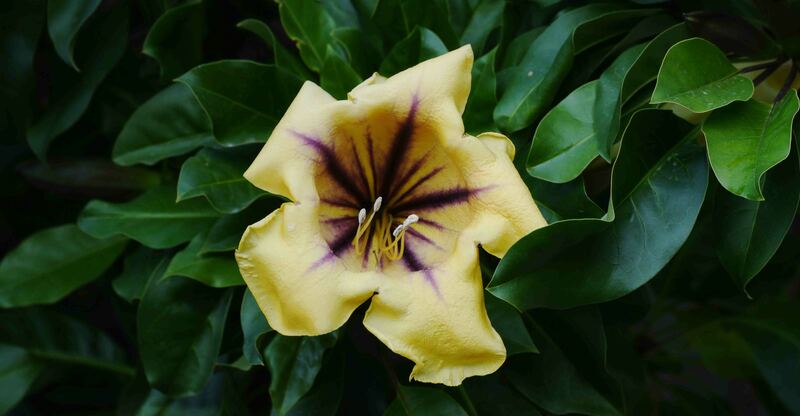 One of the many types of flowers on show. This was our first trip to Chorro at this time of the year and what a great surprise, the weather was warm and after the autumn rains everything was green and verdant. Flowers proliferated and the air was full of the promise of spring. Chorro itself is changing, there is an increase in building activity in and around the sleepy little village. This is being driven in the main by the upgrading of the Caminito del Rey. 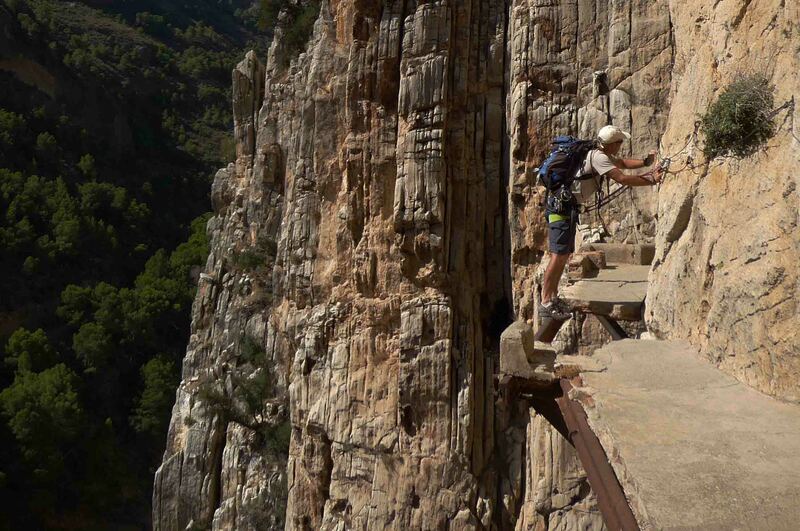 The Caminito is a walkway that is/was built onto the cliffs that flank the gorge through which the river that feeds the dam in El Chorro runs. The walkway was built to provide workers at the hydroelectric power plants at Chorro Falls and Gaitanejo Falls with means to cross between them, to provide for transport of materials, and to facilitate inspection and maintenance of the channel. Construction began in 1901 and was finished in 1905. In 1921 King Alfonso XIII crossed the walkway for the inauguration of the dam Conde del Guadalhorce, and it became known by its present name ( The Kings Walk). Over the years the walkway fell into disrepair and was closed off to the general public. Enter the climbers who found it an excellent means to access the cliffs in the gorge and from the 80’s many climbing routes, some of historical import, were developed. The walkway provided an excellent rest day excursion for those with the knowhow/equipment and ability to traverse the gorge on its crumbling remains. In places bits of it had fallen away leaving only its rusting superstructure to balance across to access the “intact” continuation. There were no handrails but there had been a safety wire installed that you could clip into to ensure that if you were unfortunate enough to be on a section of the walkway that “gave up the ghost” and fell off the cliff then you were not going with it, provided the safety wire held that is. All things considered it was a great little adventure. 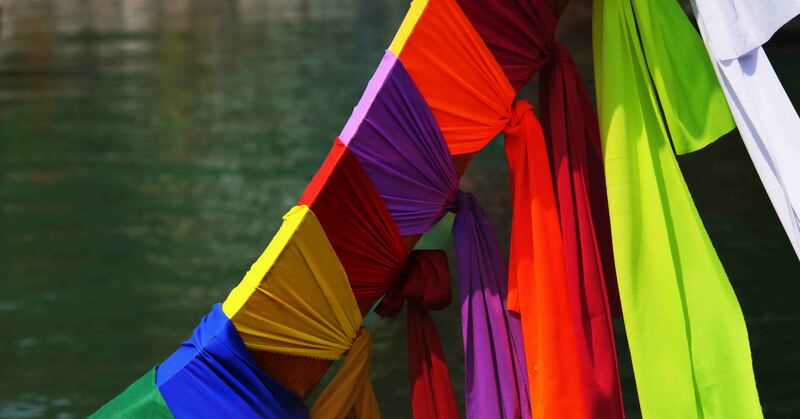 However, enter the developers (investors) who have decided that if they upgrade the walkway then it will bring more people into El Chorro in order to benefit the local community. So they have closed off the old walkway and embarked upon a 2.25M euro upgrade. Now from what I hear you will be charged anywhere between 6 and 15 Euros now to walk along what is almost a caged walkway that generally follows the line of the old caminito. No risk, a sanitised version of what was an adventure allowing the flip flop brigade to ooh and ahh in safety. Yes I know my view is selfish and egotistical, I have the ability to do the walk as it is/was and enjoy the adventure and wanted it kept that way. Unfortunately it has gone the way of so many other adventures, killed by the health and safety police and turned into a money making enterprise. Just because its broken it doesn’t need to fixed. The new Caminto showing the 2m high fence that encloses the walkway. And what of all the climbs that started from the walkway, I cannot see the owners allowing climbers to operate above a commercial enterprise when their paying customers could be creamed by a bit of falling equipment or rock dropped/knocked off by someone who probably didn’t pay to get there. Many of the existing climbs have already gone. swept away by the line of the new walkway. 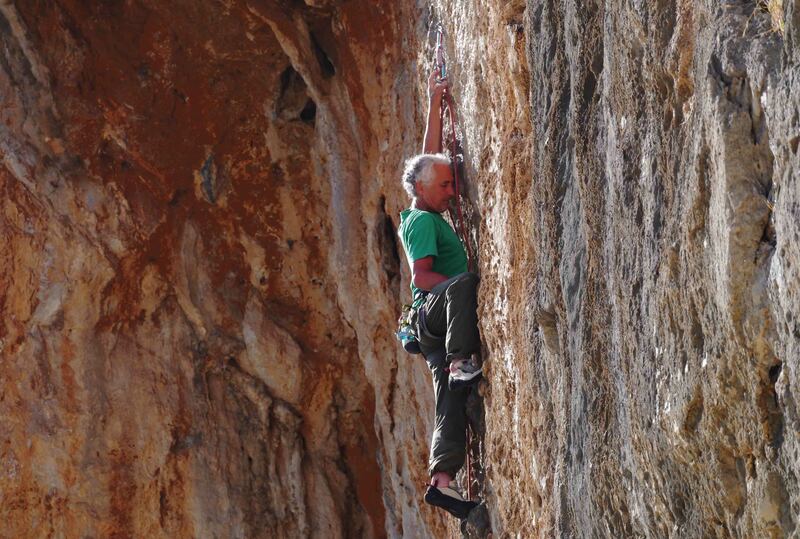 Let us not forget that a large part of El Chorro’s economy has been driven over the past 20/30 years by climbers. The local bar is called the climbers spot, the local guesthouses survive from climbers who come to the area, there is a climbing shop and many climbing bunkhouses. From what I can gather from speaking to many of the people in the area they are all against the development and were never consulted over the proposal. The only person who smiled when I mentioned it was the hotel owner who thinks it will bring people in to drink/stay in his hotel. Perhaps it will but I personally doubt it, people will be coached in or drive in along the roads (that should not have coaches on them) to a car park outside of the village from whence they will do the walk then get back in the car/coach and be driven/drive off. This will bring limited financial income to the village and may even affect what little actually comes in from the climbers. 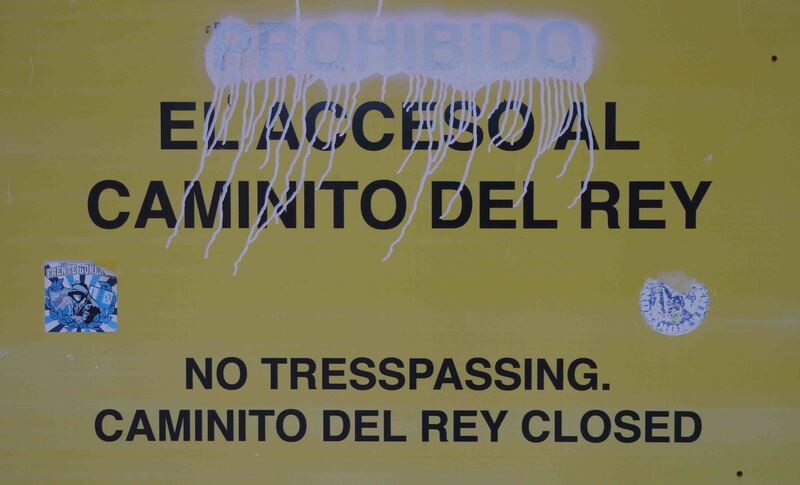 Then what of the future, what will happen if the walkway cannot pay its way and has to be closed. To service a £2M Euro debt and probable running costs you will need to have 400 people a week paying 10E a pop just to break even assuming a 10% return ( not counting the mortgage ) In this day of H&S insanity they will make sure it cannot be accessed to ensure that no-one hurts themselves from something that they own. There then follows a complete demise of all the routes/climbs that start from the existing walkway or from further up the gorge. Unless of course you walk through the railway tunnels which is against the law. But hey, I am just a minority element in the grand scheme of entraprenerial vision and my views are unlikely to make a difference. Money talks and dreams of wealth seem to override common sense, time will tell I guess. This time around I really enjoyed the climbing, I adopted a new policy of getting onto harder routes and then keeping trying them until I could climb them without falling off. My grades have gone up but my two best friends are now finger tape and Ibuprofen. A great anniversary present, cheers Jane.